Now, Tim Burton steps up to the plate with some major changes to his 1984 short film Frankenweenie, and he scores. The big differences: The original was live-action; the remake is stop-motion animation. The remake is three times longer than the original. But don’t let that concern you, as the original was a half-hour long. The biggest difference: This one’s in 3D, and terrific use is made not only of capturing depth, but also of having characters lean off the screen and into your laps. It’s the story of a boy and his dog, and things that happen on dark, stormy nights. It takes place in a typical Burton setting: a bland suburban neighborhood, minus Burton’s usual pastel colors, since it was created in stark-and-moody black and white. Young, friendless Victor Frankenstein (voice of Charlie Tahan) loves making rinky-dink 8-mm horror films in his parents’ attic almost as much as he loves his bouncy dog Sparky. Mom (Catherine O’Hara) is fine with Victor’s activities, but Dad (Martin Short) wishes he would play sports. Victor acquiesces, a decision that indirectly leads to — this is a Disney film, so there’s bound to be some trauma – the death of Sparky. It also leads to the film’s not-so-subtle political message, aimed at the religious right, about the importance of science, delivered in the wonderful voice performance of Martin Landau as overly dramatic elementary school science teacher Mr. Rzykruski. A light bulb (make that a lightning bolt) appears over the head of sad, sad Victor. Maybe he can use electricity to bring back beloved Sparky. Maybe he can convert that attic film studio into an attic science lab. And so Burton’s film begins its upbeat and almost worshipful parade of references to horror films that have come before. Obvious tips of the hat go out to both Frankenstein and Bride of Frankenstein; wildly clever ones make bows to The Birds, Jurassic Park, Gremlins, Godzilla and many more. A more blatant nod is saved for the great British film Horror of Dracula, which Victor’s parents are seen watching on TV. Screenwriter John August, who scripted Burton’s Charlie and the Chocolate Factory and Big Fish, sticks close to many elements of the short film. But he’s opened things up to include all kinds of new morbid characters, most notably Victor’s hunchbacked, bucktoothed, and downright creepy “friend” Edgar, and has given Sparky a lot more to do (plenty of Sparky point-of-view shots, mostly when he’s under duress). While the film’s first half is dedicated to introducing characters, presenting a slowly developing storyline and providing some chuckles, the second half is burgeoning with a generous supply of both funny and frightening stuff. 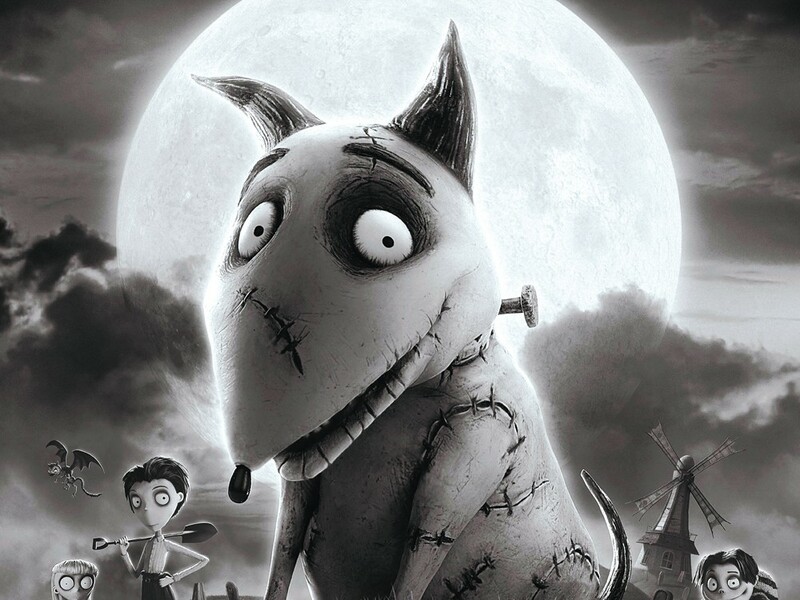 Frankenweenie never strays from its horror movie roots. It may be pro-science, but some of the science goes terribly wrong. There’s been a rumor, since the time of the original film, that Burton has included some autobiographical details in his story of Victor and Sparky, though he’s never spoken directly about losing a pet. But watching this one, a few things become very clear: Burton still has a love for old-school horror movies. He has the ability to scare the heck out of you while still maintaining a heartfelt charm, and — there’s no doubt about this part, once you’ve met the character named Mr. Whiskers — he doesn’t like cats.